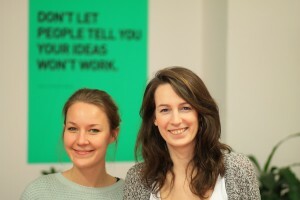 Romy interviews Hanna Lutz of social enterprise Vostel in Berlin. Vostel is an online platform matching volunteers with Berlin organizations. Hear about how they found a way to engage tourists, refugees, and everyday talented people to help their city. Romy: Welcome to this episode of Bonfires of Social Enterprise . This is Romy and I had a chance to interview Hanna Lutz in Berlin, Germany. Vostel is an online platform designed to match up volunteers with the serving needs of some of the organizations in Berlin. I found it interesting that Vostel was created out of an idea to help tourists engage in a healthier manner with the beautiful city of Berlin. As you will learn, Vostel now engages many of the refugees as volunteers. Prior to the interview, Hanna and I had a chance to talk about the fact that everyone from the locals to the government officials were attempting to figure out how to have a better relationship with the tourists, and who would have thought that it would be to ask them to get involved beyond their tourism! To leave something behind in the form of serving instead of just take pictures and memories. By the way, if you have never tried something like this, we suggest you attempt it. Working side by side with the local residents is a wonderful way to make lifelong relationships. And, I would note, good relationships are something we all could use more of these days. So, let’s listen in to a part of my interview with Hanna Lutz of Vostel. Hanna: Okay, Vostel is a social business from Berlin. It aims to connect people that want to help get involved in social, ecological and cultural projects in Berlin, but organizations and initiatives that are easy just to get involved with a few clicks. So what we do is actually show them the schedules of the different organizations that say, oh we need to help every Wednesday from nine to twelve. And so all the volunteers in our page can actually just sign up and go to the projects right away… For instance, if you were in Berlin and you would like to get involved tonight you can just type in the date of today, and you will definitely find a project where you can hop in and do valuable help. Hanna: Exactly. So far it has been rather tough for people to actually find projects in Berlin. Especially if they’re non-German speakers. Just your clicks through all the websites and actually find possibilities where they can get involved without actually need to speak any German. Now they have Vostel and can easily find a bunch of projects that sometimes even need help from non‐German speakers. Yes. Romy: Wow. And how did you get started with this Hanna, as the co‐founder? Hanna: Like, three years ago a very good friend of mine, and me, we actually met in Canada, and we were doing our studies abroad. We did some traveling through Latin America and by this time in Berlin was a big conflict concerning the tourists because there is more and more coming and we really appreciate that. But there is a lot of people who say, oh, they just come and consume the city and really leave nothing but rubbish and noise, so to say. Then we decided to create a volunteering platform that allows people that are in Berlin only short term and don’t speak German actually to get involved in the good communities and get to know the city from a different perspective. So what we did was just kind of collecting a bunch of projects that didn’t demand too many skills and didn’t demand long term commitment and didn’t demand German skills. So we decided we should really build up this project, not only stay as an initiative but actually become a company. A social business and to spread the word and get bigger and get more people involved in local communities. Romy: I think you fall in love with serving where you’re traveling once you’ve done that. I think there’s a way to engage with the local communities, and you get to see a different side of the community when you travel there and serve that. I love this idea. What was one of the first things that you saw as this started to happen? Because I sometimes know I come up with these big visions and dreams about how the world can be better, and I’ll try a project, and it’s wonderful, and it’s beyond my expectations of joy. What’s one of those good discoveries that you had once this started? Hanna: So I think besides the fact that organizations just, suddenly see more help than before because we were now targeting a new group. So…refugee help, a refugee at all those people coming from all over the world, really a great great benefit to the shelters that were searching for help because before there were only German speakers and suddenly we had people from Syria, you know from the middle east in general that were speaking Iranian, they were speaking Prussian and so on. So they were like, wow, so how did you get all those people to our organization? We’re like yeah, wow, we were just addressing people in English and not only in German, and suddenly, we found more and more people actually that could contribute. Romy: You brought up the timely issue of the refugee. What role do you see? Specifically, Vostel has played there with the organizations? Is it helping the refugees adjust or are they also serving? Hanna: Both. I think what I need to emphasize is that we never only focused on refugee aid. There’re many platforms that do so, but we experienced that all the other projects throughout the city, as suddenly lacking on both donations and volunteers. But within the refugee topic, we discovered, and this is nothing we actually aimed for was that there is a lot of refugees themselves actually getting involved now. Because, this is just a platform where they have the possibility to find projects they can get busy with. Because, maybe I need to dive deeper into the refugee topic, but there’s so many coming. And they so much want to do something. Not only sit around in shelters and waiting for the permanent permit to stay. So, volunteering gives them an opportunity actually to get busy and do something and connect with local communities too. Connect with expatriates, connect with natives and so on and, you know make friendship and feel useful, and I think this is one of the most important things you can do for them. Romy: I think any time that we find ways to bring a community together. I’m always amazed and when people connect over a purpose, how amazing the relationships can become. When you line up your heart missions, and you line up things that you enjoy doing together, it’s amazing how joyful it is to work alongside someone else of another background, and I’ve learned so much doing that way. It’s become one of my absolute favorite things to do. Romy: Yeah, I’d love what you’re doing…does not sound like you’re playing favorites with whatever the hot issue is at the moment. You’re just equally putting all of the places on the platform that need help and letting people self‐match, right? Romy: Hanna, how do you guys monetize it? What is the business side of this? Hanna: Hmm. This is also very interesting question and in the beginning, it really didn’t know how to get money with it. Because we didn’t want to ask the volunteers obviously, and we didn’t want to ask the organizations. So it was a hard task to actually find a way how we can finance all this, but then we had a big company, like actually a world‐wide operating company coming up to us saying, okay, couldn’t you offer what you do, or what you offer to private people to offer to our employees? And we’re like, yeah of course. And so, this was actually the initiative or the starting point that we decided to build up a corporate volunteering program. And of course we organize and run big volunteering events or teams and from five to a hundred people can actually get involved and make a change. Romy: <Laughter> My goodness. Hey Hanna, could you tell me about your team there? Hanna: Of course, like we’re still pretty little. We’re a small team. We have a guy actually doing our website. We are working closely with him. He’s such a smart person, and he really knows how to bring our ideas into IT language and then we have several freelancers supporting us with different stuff. And we always take interns in case there’s someone who wants to get involved in our company. Romy: Okay. What kind of intern would you be looking for right now? Hanna: We are looking for interns that help us to actually build up the Vostel community. We now want to bring them into the physical space. That means we plan a lot of meetups where people can really connect and meet each other in person and then, develop new ideas together. Maybe even develop own projects, so they get more connected to the idea of Vostel and really inspired to spread the word. Romy: Oh, okay. That’s exciting. And you know, it’s always fun to be in on the ground floor of an organization and bring new ideas and see it come into life. Romy: Would you be able to give me just, I don’t need exact numbers, but approximately how many volunteers have you engaged with since you began and maybe talk a little bit about how many organizations have used the volunteers on your platform? Both sides, maybe? Hanna: Can’t tell you the exact number but it’s, from August 2015 to now, it’s about two thousand volunteers throughout Berlin that are registered on our platform. We have over fifty organizations that have registered on the website to find volunteers. And I think about one hundred projects that have been or still are provided with volunteers. And there’re new organizations signing up every day basically. Romy: If you could dream and you had the money and the resources and all those things, what would a big dream look like for you and your team? Hanna: So, I think, we really like to be a small team and wouldn’t necessarily be growing our company is growing itself. But we would really like to bring Vostel to all the bigger and smaller cities in Berlin. So that even more people can get involved because it’s just so easy. Organizations register or sign up on our website and then they easily find volunteers, so this solution can be scaled, but still we need some time to do so. Because we’ve really tried to have a very close relationship to each little and big organization and initiative. So really, to make sure that both sides, volunteers, and organizations, are fully satisfied. We lose track of the stuff that is happening, and we think it really needs mediators and people that do all this volunteering management. So we don’t want to give up on this position, and so we still need to learn and grow slowly. But grow eventually and really give the offer to Germany basically. Romy: I’m in agreement. That’s one of the most important things to my heart too, are relationships. I think, together, we can do a lot when we come together. We were never meant to be off in isolation, but communities of people. There’s a bunch of smart folks out there. Romy: Yes, well, Hanna how would, how would somebody reach you? What’s the best way? Maybe give us your website? Hanna: www Vostel.de and of course you can follow us on Twitter, it’s @Vostel_Berlin. You can follow us on Instagram; it’s Vostel Berlin. And you can just Google us and find a bunch of nice press material. Read a lot about our role in tourism sector too, and find a bunch of videos there, so you can see us live and in color. Hanna: Get a little entertainment. Romy: Oh, I love it. I love it. Well, we’d love to do a little storytelling, periodically, over time, if that’s all right with you. Hanna: That sounds just perfect. Thank you very much. I really enjoyed interviewing Hanna. Our time together reminded me about something I just love and that is helping others. It reminds me how much a drop of serving can make a difference when you put a whole bunch of drops together! By the way, Hanna and her team have made a difference as many of the tourists we discussed in the beginning actually serve the city now while visiting. Great job Vostel! As you all know, we like to close out a song of an artist curated by Detroit’s Assemble Sound whenever we can. So, please meet Lando with his song, Tender.